It is usually a miracle when I can get the flash disk in to the port in the first attempt. Current USB connections require you to insert the connector right way up. 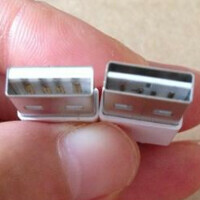 While designs for a reversible USB connector has been approved, it is far away from being released. Apple is set to bring the technology earlier with its lightning connector reversible at both ends. This leak comes from an Australian teenager who leaked several parts of iPhone 5c and iPhone 5s last year. Apple is set to reveal its iPhone 6 variants next month in the wake of IFA Berlin 2014. Along with iOS 8, iPhones might features this new Lightning connector as well. Apple plans to achieve this by manufacturing a connector with thin pins in the center. This will allow for reversibility because there will be same room to connect it without trying to find the right way up.